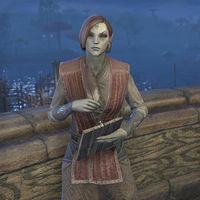 Edryno Giryon is a Dunmer found in Vivec City. She is a student of Divayth Fyr, and asks you to deliver some mushrooms to Sadrith Mora. "I just received a notice from Divayth Fyr that he will not be accepting any more deliveries from me. Ungrateful s'wit. On a positive note, however, he also won't evaporate me, so thank you!" This page was last modified on 9 February 2019, at 03:05.